The development of compassion and bodhichitta is the point of the path to enlightenment, the end result: the removal of all separateness from others and the spontaneous capacity to benefit all sentient beings perfectly. Why “courageous”? Because genuine compassion encompasses all living beings, including the harmers, the negative ones, not just the innocent victims. However, a bird needs two wings, wisdom and compassion. Without the development of renunciation of suffering and its causes (which comes from understanding of the law of karma and the workings of one’s own mind) and of the wisdom that sees reality as it is (which comes from understanding dependent arising and emptiness) one cannot fully develop such radical compassion. 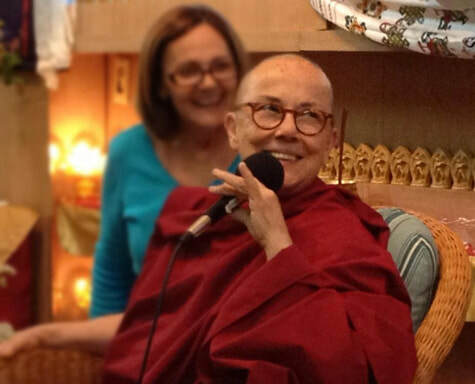 The great bodhisattvas are fierce in their determination to never give up on sentient beings: they “think in terms of eons,” as His Holiness the Dalai Lama says. £125 Pay it Forward Price covers the cost of your retreat and helps us to sustain our Buddhist group organising the next event. £85 Sustainable Price covers the cost of your retreat. £65 Supported Price reflects a partial bursary toward the cost of your retreat and is intended for those with minor financial need. Several options for meals are available.